“We’re here to disciple the nations, here in Hawaii and everywhere else.” — 2014 Republican gubernatorial nominee James “Duke” Aiona – whose campaign, suggests a new Hawaii ABC/KITV survey, may be gathering momentum heading towards the November 2014 mid-term elections – speaking (link to video) at a 2009 Hawaii conference of the globally active New Apostolic Reformation (NAR) movement. But what Hawaii and stateside mainstream media is choosing to ignore, in the lead up to the November 4, 2014 mid-term election, goes even further. A slate of candidates tied to a dominionist religio-political movement helping wage the ongoing anti-LGBT crusade in Uganda and whose leaders celebrate the dedication of Lenin’s revolutionary Bolsheviks and urge their followers to burn scripture, art, and religious objects associated with competing faiths may take the executive branch of an entire U.S. state; and, this is not considered “news”. 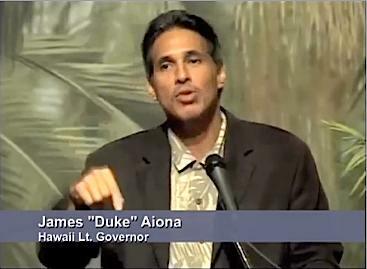 In early October 2014 I informed one Hawaii mainstream media venue partnered with Hawaii’s ABC affiliate KITV – a venue which in late October 2010 picked up on my articles and began to cover Aiona’s extensive ties to Ed Silvoso’s International Transformation Network (the Associated Press also covered my reporting on Aiona) – that Duke Aiona’s 2014 election running mate, Republican candidate for Lt. Governor Elwin Ahu, a pastor of a growing Hawaii megachurch, also has ties to the New Apostolic Reformation movement and, along with Aiona, spoke at Ed Silvoso’s 2009 International Transformation Network Hawaii conference. While Aiona has since 2010 distanced himself from Silvoso and the ITN, the fact that gubernatorial candidate Aiona’s running mate Elwin Ahu was also a speaker at ITN Hawaii 2009 brought, to my mind, renewed relevance to Aiona’s past ITN ties. What is happening in Hawaii this electoral cycle is not an anomaly; it is symptomatic of a broad trend within American political conservatism; even as liberals have written off the politicized religious right, the movement continues to cannibalize the once secular Republican Party to the extent that candidates unquestionably linked to a blatantly pro-theocracy (or “dominionist”) strain of charismatic Christianity (which helped launch the political career of 2008 Republican vice presidential nominee Sarah Palin) have in the 2014 election won the GOP’s imprimatur to head the executive branch of the 50th state to join the American union. “We break generational curses ! We break generational curses ! And we plead the blood of Jesus over ever altar of demon ! Over every altar of ancestral spirit ! Over every altar of false religion ! And in Jesus name we declare that You are the King of Hawaii ! You are the Lord of Hawaii ! We dispossess the gods of Hawaii, and we lift up the one and true God, Jesus Christ. 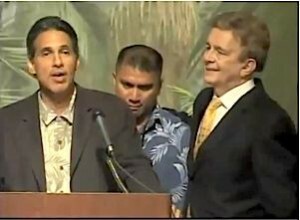 – NAR apostle Pat Francis, speaking (link to video) at 2009 Hawaii International Transformation Network conference that also boasted then-Hawaii Lt. Governor Duke Aiona (now running for the Hawaii governor’s seat) and Hawaii megachurch pastor Elwin Ahu (the 2014 election GOP nominee for Lt. Governor) as featured speakers. On the condition of the “4th estate”, media nominally responsible for informing American voters, this speaks volumes. The GOP may not prevail in Hawaii, but on the national level it has a proven ability to shut down the federal government and tie Congress in knots; and New Apostolic Reformation influence is not restricted to Hawaii. The movement gave us 2008 vice presidential candidate Sarah Palin and Texas governor Rick Perry’s abortive 2011 presidential bid. Over the course of 2010, leading up to the 2010 mid-term election – during which Tea Party movement-backed Republicans swept in to take Congress – I covered in numerous articles (see here for an anthology of that work), published by various venues including the Huffington Post and Alternet, the numerous, close ties between GOP 2010 gubernatorial nominee James “Duke” Aiona and the global dominionist movement known as the New Apostolic Reformation – a religio-political phenomenon stylistically very different from the Tea Party but which shares much of its agenda. Aiona’s ties to the NAR, were so profound that in 2006 he flew over many thousands of miles from Hawaii – on a trip financed by the Hawaii affiliate of Silvoso’s ITN – to Argentina to attend evangelist and NAR godfather Ed Silvoso’s yearly “Nation Transformation” (ITN) conference. Promotional video from the conference distributed by Silvoso’s ministry showed Aiona praying together with and holding the hand of Uganda’s First Lady Janet Museveni. Referring to Silvoso’s efforts to “transform” First Lady Museveni’s nation of Uganda, Aiona enthuses, in the video, “It’s taken me 9,000 miles, approximately, away from home to understand what is happening in Uganda”. 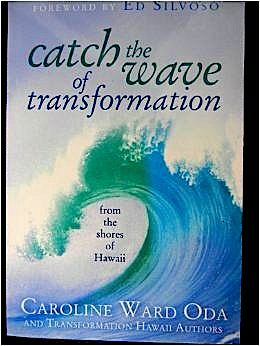 As noted in a December 2010 story in the Honolulu Civil Beat, Duke Aiona had even contributed a chapter to the book “Catch The Wave of Transformation” an anthology put out by the Hawaii affiliate of Ed Silvoso’s International Transformation Network, which has ongoing operations across the globe, from Hong Kong to Jacksonvill, FL, to Uganda – where Silvoso operatives are close to the heart of that nation’s ongoing crusade against Ugandan LGBT citizens. One of the members of the team of Silvoso assembled in 2005 to “transform” the Sub-Saharan nation of Uganda was Bishop Julius Oyet, an influential Ugandan evangelist and New Apostolic Reformation member with ties to Uganda’s president Yoweri Museveni and First Lady Janet Museveni. In 2006, both Duke Aiona, Janet Museveni, and one of Oyet’s movement colleagues Ugandan evangelist Alex Mitala (who has also helped wage Uganda’s anti-LGBT rights crusade), attended Ed Silvoso’s 2006 ITN conference in Argentina. 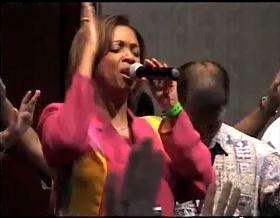 Footage from the 2006 event, distributed by Silvoso’s ministry, shows Aiona holding hands, in prayer, with First Lady Museveni – who is widely rumored in Uganda to be a major power behind Uganda’s ongoing antigay crusade. One year after Aiona’s attendance at the 2009 Hawaii ITN conference, a member of Silvoso’s Uganda “transformation” team (per accounts in books published by members of Silvoso’s ITN), apostle Julius Oyet, told French journalist Dominic Mesmin (link to video) that he, Oyet, had played a central role in Uganda’s now-notorious Anti Homosexuality Act (signed into law by Ugandan President Yoweri Museveni in February 2014, then struck down in August 2014 down by Uganda’s highest court, on a procedural technicality.) In an extended 1-hour interview with Mesmin, Oyet claimed that he had served on a committee which conceived the Anti Homosexuality Bill and even picked the Ugandan politician, MP David Bahati, who introduced the bill in Uganda’s parliament. At Ed Silvoso’s 2009 Hawaii conference (which that year had been relocated from its traditional location in Argentina to Hawaii) Duke Aiona declared, jabbing his finger in air for emphasis, “We’re here to disciple the nations, here in Hawaii and everywhere else.” Aiona was then blessed and anointed, with the laying on of hands, in a ceremony similar to one carried by New Apostolic Reformation leader Thomas Muthee, in 2005 at a Wasilla, Alaska church, to bless and anoint, as a political candidate, Sarah Palin. What does “discipling” mean within the context of Silvoso’s movement ? In his book Transformation: Change the Marketplace and You Change the World (2007, Regal Books) Ed Silvoso explains that “discipling” was something done to their respective subject nations by 1) the Roman Empire, 2) Lenin’s Revolutionary Bolsheviks, 3) Mao’s Red Guard during the bloody Cultural Revolution, and 4) the followers of Ayatollah Khomeini, in Iran. Ed Silvoso is credited with having convened a 1999 gathering, in Singapore, that led to the founding of what may be the New Apostolic Reformation’s biggest apostolic network, the International Coalition of Apostles, which has fast-growing affiliate apostolic networks from Africa to Europe. In 2010 leadership of the ICA, which does not make public its global membership of ICA apostles, passed from church growth specialist C. Peter Wagner (interviewed, concerning the NAR, by NPR/Fresh Air radio show host Terry Gross in October 2011) to apostle John P. Kelly, whose 1999 book End Time Warriors urged members of his burgeoning NAR to “embrace” the Latter Rain and Manifest Sons of God movements, the latter of which forecast that in the end-times there would arise a race of supernaturally endowed believers who would cleanse the Earth of evil, as well as humans believed to be in league with the forces of evil.